Trunk room lamp switch Inputs trunk lid open/close condition to BCM. 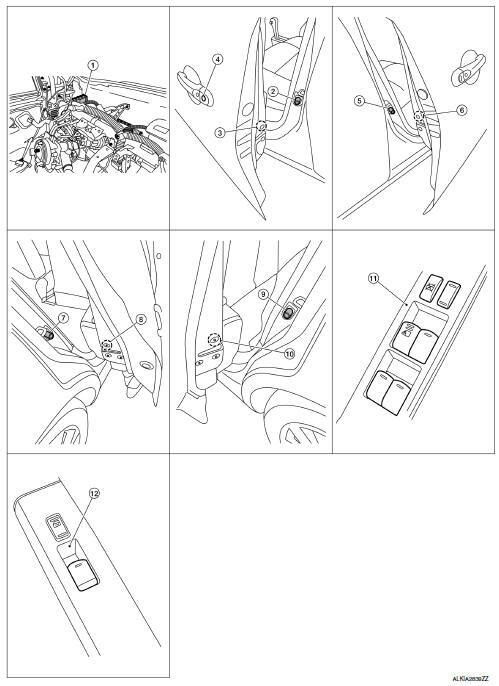 Stop lamp switch Inputs the brake pedal position condition to BCM. Push button ignition switch Inputs the push button ignition switch ON/OFF condition to BCM. Door switch Inputs door open/close condition to BCM. Remote keyless entry receiver Receives lock/unlock signal from the Intelligent Key, and then transmits to BCM. Request switch Inputs lock/unlock operation to BCM. Intelligent Key Transmits button operation to remote keyless entry receiver. Outside key antenna Detects if Intelligent Key is outside the vehicle. Inside key antenna Detects if Intelligent Key is inside the vehicle. Combination meter Display, buzzer (combination meter) and KEY warning lamp are installed to combination meter. BCM Controls the Intelligent Key system. Trunk opener request switch Inputs the trunk open request to the BCM. Selective unlock operation mode can be changed using вЂњAUTO LOCK SETвЂќ mode in вЂњWORK SUPPORTвЂќ. Refer to DLK-36, "DOOR LOCK : CONSULT Function (BCM - DOOR LOCK)". Vehicle Speed Sensing Auto Door Lock*1 All doors are locked when the vehicle speed reaches 24 km/h (15 MPH) or more. The ON/OFF switching of the automatic door locks (LOCK) function and the type selection of the automatic door locks (LOCK) function can be performed at the WORK SUPPORT setting of CONSULT. Refer to DLK-36, "DOOR LOCK : CONSULT Function (BCM - DOOR LOCK)". IGN OFF Interlock Door Unlock*1 All doors are unlocked when the power supply position is changed from ON to OFF. The ON/OFF switching of the automatic door locks (UNLOCK) function and the type selection of the automatic door locks (UNLOCK) function can be performed at the WORK SUPPORT setting of CONSULT. 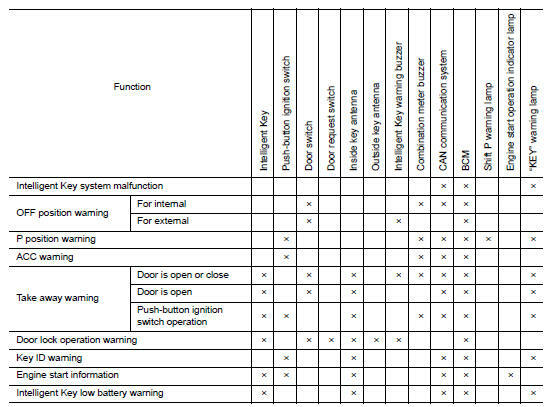 Refer to DLK- 36, "DOOR LOCK : CONSULT Function (BCM - DOOR LOCK)". The Intelligent Key system is a system that makes it possible to lock and unlock the door locks (door lock/ unlock function) by carrying the Intelligent Key, which operates based on the results of electronic ID verification using two-way communication between the Intelligent Key and the vehicle (BCM). The settings for each function can be changed with CONSULT. If an Intelligent Key is lost, a new Intelligent Key can be registered. A maximum of 4 Intelligent Keys can be registered. It is possible to perform a diagnosis on the system and register an Intelligent Key with CONSULT. When pressing the request switch, it is possible to lock and unlock the door by carrying the Intelligent Key. When the BCM detects that each door request switch is pressed, it starts the outside key antenna and inside key antenna corresponding to the pressed door request switch and transmits the request signal to the Intelligent Key. And then, check that the Intelligent Key is near the door. 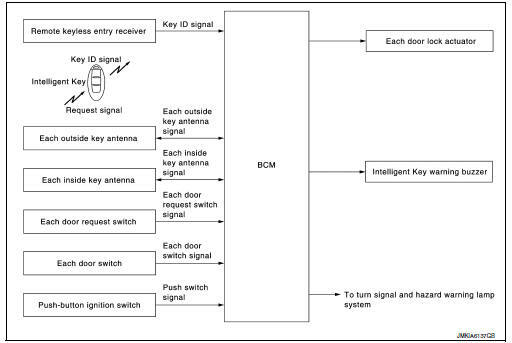 If the Intelligent Key is within the outside key antenna detection area, it receives the request signal and transmits the key ID signal to the BCM via remote keyless entry receiver. BCM receives the key ID signal and compares it with the registered key ID. 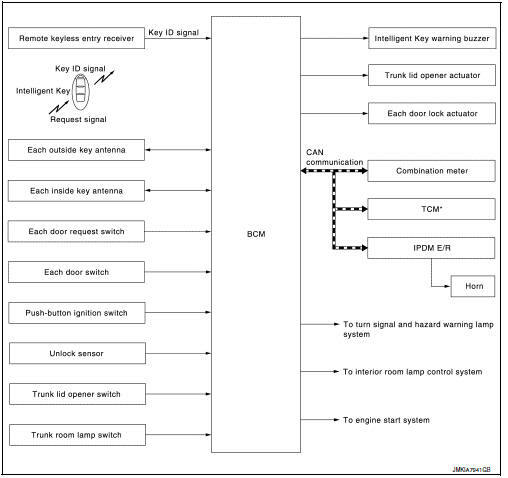 BCM transmits door lock/unlock signal and operates each door lock actuator. At the same time, BCM blinks hazard warning lamp (lock: 1 time, unlock: 2 times) and sounds Intelligent Key buzzer (lock: 1 time, unlock: 2 times) as a reminder. If the following conditions are satisfied, door lock/unlock operation is performed if the door request switch is operated. *: Even with a registered Intelligent Key remaining inside the vehicle, door locks can be unlocked from outside of the vehicle with a spare Intelligent Key as long as key IDs are different. Door lock function can be changed using вЂњLOCK/UNLOCK BY I-KEYвЂќ mode in вЂњWORK SUPPORTвЂќ. Refer to DLK-36, "INTELLIGENT KEY : CONSULT Function (BCM - INTELLIGENT KEY)". 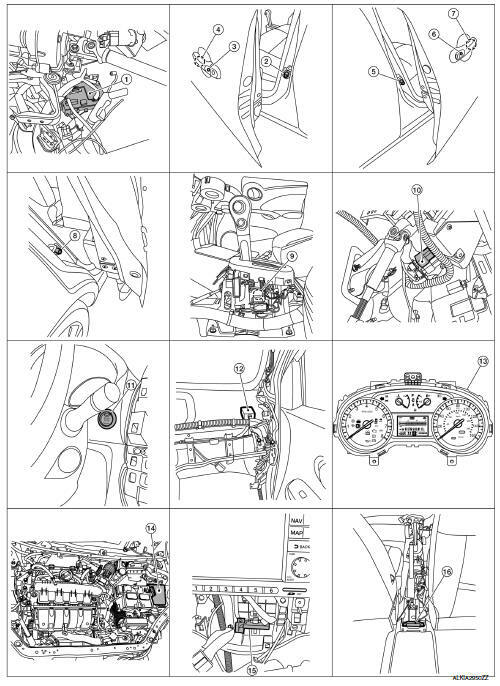 The outside key antenna detection area of door lock/unlock function is in the range of approximately 80 cm (31.50 in) surrounding the driver, passenger door handles (1). However, this operating range depends on the ambient conditions. For the operation check, BCM blinks hazard warning lamps (lock: 1 time, unlock: 2 times) and sounds Intelligent Key warning buzzer (lock: 1 time, unlock: 2 times) when door lock or unlock operates by operation of each door request switch. Refer to DLK-36, "INTELLIGENT KEY : CONSULT Function (BCM - INTELLIGENT KEY)". After door is unlocked by door request switch operation and if 30 seconds or more passes without performing the following operation, all doors are automatically locked. However, operation check function does not activate. Auto door lock mode can be changed by the вЂњAUTO LOCK SETвЂќ mode in вЂњWORK SUPPORTвЂќ. Refer to DLK- 36, "INTELLIGENT KEY : CONSULT Function (BCM - INTELLIGENT KEY)". Parts marked with × are the parts related to operation. 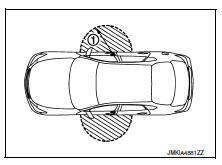 When the BCM detects that trunk lid opener switch is pressed, it starts the outside key antenna (rear bumper) and inside key antenna and transmits the request signal to the Intelligent Key. Then, checks that the Intelligent Key is near the trunk lid. 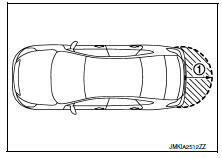 If the following conditions are satisfied, the trunk lid can be opened. 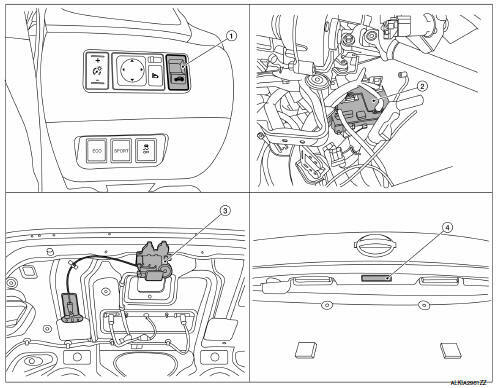 The outside key antenna detection area of trunk lid open function is in the range of approximately 80 cm (31.50 in) surrounding trunk lid opener switch (1). However, this operating range depends on the ambient conditions. Parts marked with ÷ are the parts related to operation. The Intelligent Key has the same functions as the remote control entry system. Therefore, it can be used in the same manner as the remote controller by operating the door lock/unlock button. Remote keyless entry system controls operation of the following items. To check that the Intelligent Key works normally, use within 1 m (3 ft) range of each door, however the operable range may differ according to surroundings. When door lock/unlock button of the Intelligent Key is pressed, lock signal or unlock signal is transmitted from Intelligent Key to BCM via remote keyless entry receiver. BCM receives the signal and compares it with the registered key ID to the vehicle. BCM transmits door lock/unlock signal to each door lock actuator and operates each door lock actuator, when key ID matches. At the same time, BCM blinks hazard warning lamps (lock: 1 time, unlock: 2 times) and sounds Intelligent Key buzzer (lock: 1 time, unlock: 2 times) as a reminder. When trunk button of the Intelligent Key is pressed, the trunk open signal is transmitted from the Intelligent Key to the BCM via remote keyless entry receiver. 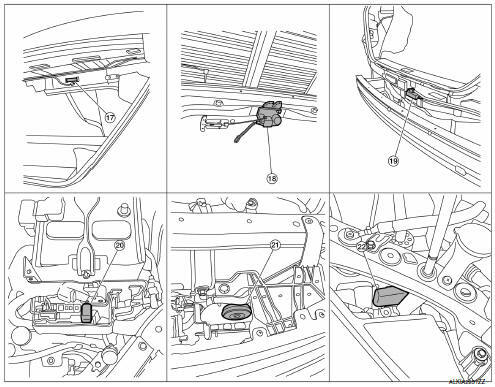 When BCM receives the trunk open request signal, it operates the trunk lid opener actuator and opens the trunk. *: Pattern of trunk open button can be selected using CONSULT. Refer to DLK-36, "INTELLIGENT KEY : CONSULT Function (BCM - INTELLIGENT KEY)". When ignition switch is OFF, BCM transmits theft warning horn request signal to IPDM E/R. Then, IPDM E/R turns on and off horn intermittently. The alarm automatically turns off. For the operation check, BCM blinks hazard warning lamps (lock: 1 time, unlock: 2 times) and sounds Intelligent Key warning buzzer (lock: 1 time, unlock: 2 times) when door lock or unlock operates by each remote controller button operation of Intelligent Key. After door is unlocked by Intelligent Key button operation and if 30 seconds or more passes without performing the following operation, all doors are automatically locked. However, operation check function does not activate. Key reminder is the function that prevents the key from being left in the vehicle. Key reminder has the following 3 functions. *:When closing the door if something comes into contact with the door lock switch it might activate the door locks accidentally, but the unlock operation will override this. The above function operates when the Intelligent Key is inside the vehicle. However, there may be times when the Intelligent Key cannot be detected, and this function does not operate when the Intelligent Key is on the instrument panel, rear parcel shelf, or in the glove box. Also, this system sometimes does not operate if the Intelligent Key is in the door pocket for the open door. 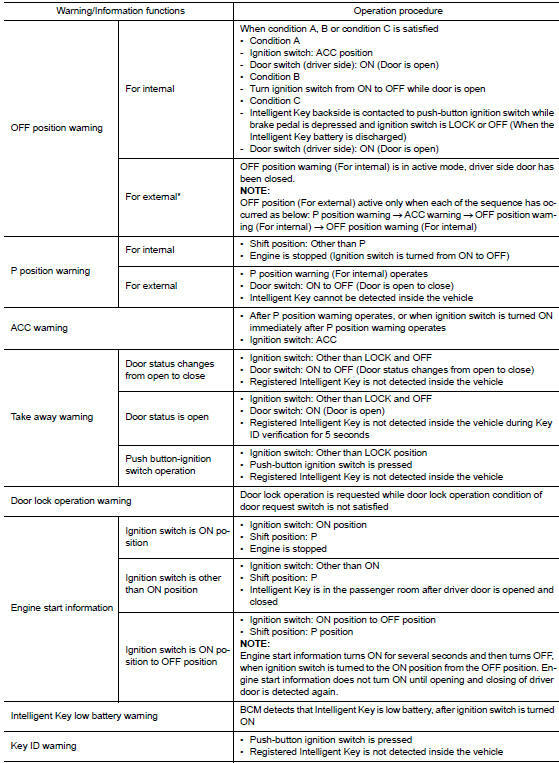 The warning function are as per the following items and are given to the user as warning information and warnings using combinations of Intelligent Key warning buzzer, combination meter buzzer, KEY warning lamp, shift P warning lamp and engine start operation indicator lamp. Operation condition of warning and information is as per the following table. *: M/T models do not apply. 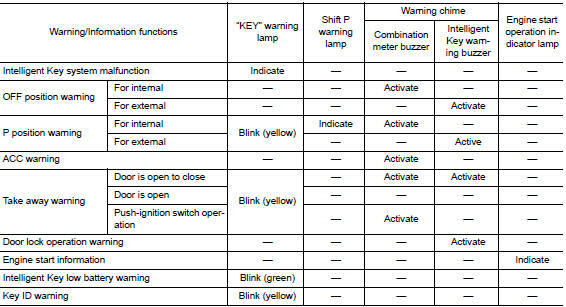 The following table shows the alarm or warning methods with chime.